Autonomy requires accuracy and the Piksi™ Multi RTK GNSS receiver is designed with autonomous vehicles in mind. Its centimeter-level accuracy is designed for easy integration into the automotive core sensor suite and multiple bands and satellite constellations improve the performance of autonomous vehicles. The Swift Navigation system improves robustness by providing 99th percentile accuracy. The system also moves gracefully from the centimeter-accurate fixed RTK mode to the decimeter-accurate float RTK mode, while providing substantially improved positioning performance, even in degraded signal conditions. Swift Navigation’s automotive positioning system is able to demonstrate the accuracy required to enable the next generation of autonomous vehicle applications requiring lane or sub-lane level position. The benefits of Piksi Multi go well beyond adding autonomous functionality. Automakers and navigation OEMs can reduce solutions costs, improve product flexibility, save fuel, reduce maintenance costs, locate equipment, improve safety and reduce risk with Swift. 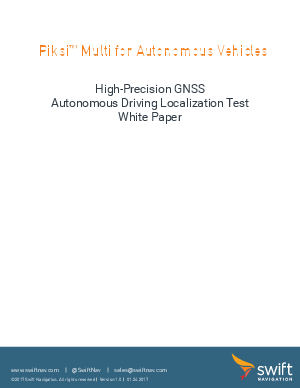 Download the Free White Paper: Piksi Multi for Autonomous Vehicles to learn how Swift Navigation’s centimeter-level accurate GNSS solution improves the performance of autonomous vehicles.